Delightful family home which has been renovated to a high standard by the present owners and offers versatile accommodation with an excellent master bedroom suite. The property benefits from oil fired central heating, double glazing and spacious and light accommodation. It would lend itself easily into division to create owner's accommodation and a gîte if required. It is attached to a barn which is believed to be available to purchase by separate negotiation. The property is situated in a rural hamlet in Ille-et-Vilaine in the Brittany region of France, near a village where you will find a bakery, bars, a post office, and a commercial centre with a small supermarket, petrol station, bank and pharmacy. Within easy reach is the Normandy town of St James (about 12 minutes drive) with its supermarket and out of town hypermarket with petrol station, street market (Mondays), post office, banks, bakers/patisseries, bistro, bars and restaurants. There is a trout fishing lake 1km away on the road to St. James which children love, or more serious fishing in the valley of the Selune and Beuvron rivers. 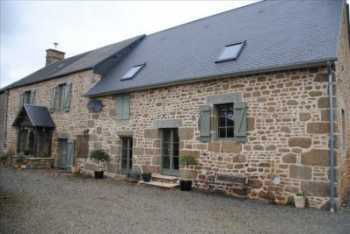 Although situated in Brittany, the property is just over the border from Normandy, and views of Mont St. Michel are nearby. The bay of Mont St. Michel is about 45 minutes drive and has many many attractions, as well as being an excellent base for history and culture. The Parliament of Brittany (Parlement de Bretagne) is approximately 51 km away. The closest airport is Rennes Airport (57 km) and in the surrounding area there are Dinard Airport (58 km), St. Brieuc Airport (114 km), or Angers Airport (127 km). The ferry port at Caen Ouistreham is about 150 km, Le Havre and Dieppe are about a 3 hour drive and the Eurotunnel at Calais is about a 4 1/2 hour drive. Lounge/dining room : 9.73m x 5.43m - Glazed front door and 2 windows to the front elevation. Laminate floor. Exposed beams. Granite fireplace with woodburner. 3 radiators. TV aerial socket. Central heating thermostat. 2nd kitchen/utility room : 5.73m x 2.41m - Glazed double Frenchdoors and window to the rear elevation. Tiled floor. Range of matching base and wall units with roll edge worktops incorporating 1 1/4 bowl stainless steel sink unit. Tiled splashbacks. Space for cooker. Boiler. Space for under counter fridge and washing machine. Radiator. Utility/boot room : 3.21m x 2.42m - Window to the rear elevation. Range of base and wall units matching the 2nd kitchen. Worktops with tiled splashbacks. Tiled floor. Radiator. Bathroom : 2.56m x 2.18m - Window to the rear elevation. Tiled floor. Hot water cylinder. Toilet. Pedestal hand basin. Bath with mixer/shower tap adjustment. Heated towel rail. Hatch to loft space. Living room : 5.39m x 3.11m - Window to the front elevation and small window to the rear elevation. Exposed stone. Radiator. Spotlights. Kitchen/dining room : 6.38m x 5.66m - Glazed door to the front and rear elevations. Window to the front elevation and 2 windows to the east elevation with internal shutters. Parquet floor. Butler sink with mixer tap. Base units with solid wood worktops. Exposed stone and beams. Open working fire. Space for freestanding cooker with tiled splashback. Stairs to first floor. En-suite bathroom : 5.61m x 2.48m - On 2 levels. Velux window and window to the front elevation. Oak floor. 2 radiators. Freestanding bath with mixer tap. Toilet. Vanity unit. Dressing area : (Could be converted into an additional bedroom) 3.08m x 3.05m - Velux window to the rear elevation. Built in cupboard. Oak floor. Radiator. Sloping ceiling. Landing : Hatch to loft space. Exposed beams. Radiator. Bedroom 2 : 5.09m x 3.49m - Window to the front elevation. Radiator. Exposed beams. Bedroom 3 : 4.19m x 3.51m - Window to the front elevation. Radiator. Exposed beams. Shower room : 3.29m x 1.76m - Pine clad walls and ceiling. Extractor fan. Toilet. Corner shower with jets. Pedestal hand basin. Bidet. Heated towel rail. Exposed beam. A gravel drive leads along side the property to a parking and turning area. The front garden is laid to lawn with mature shrubs, trees and a rockery. To the rear of the property there is an attached garage built of block under a slate roof (5.58m x 4.39m) with concrete floor, wooden garage doors and a pedestrian door to the east elevation; power and light; first floor storage. Outside tap. There is a covered log storage area. The rear garden has post and rail fencing and is laid to lawn with flower and shrub borders. Mains water, telephone and electricity are connected. Drainage to an all water septic tank. Broadband internet connection. Oil fired central heating. Ille et Vilaine... New In! AHIB-4-SP-001164 Nr Monthault 35420 Semi-detached house in rural hamlet with small garden (209m2). AHIB-3-KL-2276 Saint-Malo 35400 A fantastic opportunity to buy this well established beautiful b&b situated on the seafront of the bay of the Mont Saint Michel. AHIB-4-SP-00906 Nr Louvigné-du-Desert 35420 Beautifully presented traditional stone house in Brittany with 1 1/4 acre garden. AHIB-SP-001105 Pretty 2 bedroom detached house with 2.5 acres and outbuildings in quiet rural hamlet. AHIN-SIF-00937 Saint Georges de Reintembault 35420 Detached farmhouse and barns to modernise in quiet rural hamlet in Brittany.